IN the Belfast Telegraph Gail Walker is making an honest fist at linking Madeleine McCann to a current news story, in this instance Madonna’s attempt to secure another child. The full report on Madeleine McCann. The problem is that more youngsters Madonna hangs out with, the older she looks. She might prefer to adopt a few pensioners, or Old Mr Anorak. Why all this moral fingerpointing about Madonna’s wish to adopt a second child from Malawi? Fair enough, she’s a global megastar. Fair enough, she’s only recently dumped ‘our own’ Guy Ritchie — the chap who for a while gave us rights of ownership to ‘Madge’ — and that brought her domestic arrangements into focus once again. But really we had all this last time round, with the adoption of her son David. The reaction then was particularly venomous, with the little boy hunted from the airport to his front door with the same hysterical mania as if he’d actually been Madeleine McCann. Merry James – not Grace, the child who melted Madonna’s heart? And anyone seen Jessica Kondanani? 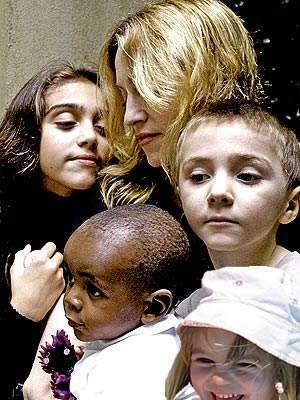 Madonna filed adoption papers for David Banda on October 10, 2006. Madeleine McCann went missing on 3 May 2007. Had Madonna appeared with Madeleine McCann back then, would we have noticed? Madonna held her ground then, with her usual disdain for whatever drivel the media can serve up about her.